Adsorption is a process in which molecules adhere to the internal surface of a solid porous material, much like a “sponge” soaks up water. Adsorbents have enormous internal surface areas (often several 1000 m2/g), available for capturing carbon dioxide from all manner of gas streams. 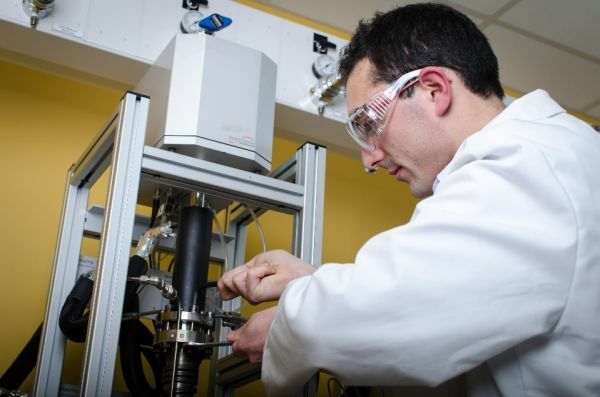 Our research group is focused on two aspects of adsorption technology: developing next generation adsorbent materials, and developing advanced processes to utilise these adsorbents. New adsorbents are developed by careful molecular engineering in which we design the atomic level pore sizes and surface chemistry to enhance the adsorption of carbon dioxide while limiting the adsorption of other species in the gas phase, such as nitrogen or methane. Once synthesized in the laboratory and fully characterised, the materials are ready for the second stage of our research program in which we develop pressure, temperature, and composition swing processes which allow us to adsorb and desorb carbon dioxide from the adsorbents. The net result is a stream of pure carbon dioxide. Our overall goal is to dramatically reduce the capital and operating cost of carbon capture systems.